The biceps and triceps muscles make up most of our upper arm muscles. These muscles enable us to do many activities like climb, move things, and lift heavy objects. Is it important to know more about these muscles and how they work for us in order to utilize and properly care for them. What, then, is the difference between biceps and triceps? Let’s discuss them more in detail to understand what sets these muscles apart. Biceps are also called the “biceps brachii.” The term originated from the Latin word musculus, meaning “little mouse.” This was based on the appearance of the flexed biceps resembling the back of a mouse. 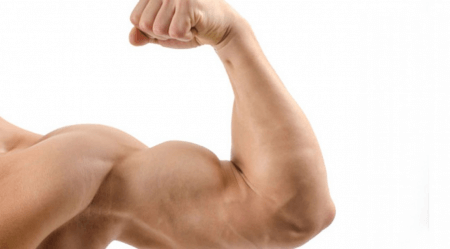 Biceps brachii is also a Latin phrase which stands for “two-headed muscle of the arm.” The biceps are made up of two muscle bundles, namely: the long head and the short head. These particular muscles function as flexors. This means that they help bend the elbow, thereby decreasing the angle between the forearm and the upper arm. So technically, the biceps are the muscles responsible for the pulling action. They are also the muscles used in forearm rotation. In trying to develop the biceps, the types of exercises that should be done are those that center on bringing weight closer to your body. Triceps are also called the “triceps brachii.” Sometimes they are referred to as a “three-headed muscle.” The term “triceps” originates from the Latin words tri, meaning “three,” and ceps, meaning “head.” The three muscle bundles that make up the triceps are the lateral head, the long head, and the medial head. These are located at the back of the upper arm. Triceps function as extensors. This means that they help increase the angle between the forearm and the upper arm. Triceps are the muscles you exert for the pushing action. To develop the triceps, you need to focus on exercises that push weight away from the body. 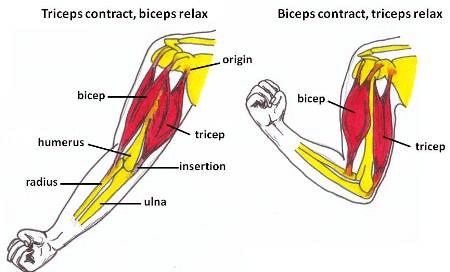 Biceps and triceps are opposite functioning muscles. This means that if one flexes, the other relaxes. Biceps are made up of two muscle bundles: the long head and the short head. Triceps, on the other hand, are made up of three muscles in the back of the upper arm: the lateral head, the long head, and the medial head. Both muscles move the elbow and the shoulder; however, the triceps move in the opposite direction as the biceps. Biceps are for pulling while triceps are for pushing. Another main action of the biceps is the forearm rotation. Biceps are flexors and they decrease the angle between the arm bones. Conversely, the triceps are extensors, which increase the angle between the forearm and upper arm.